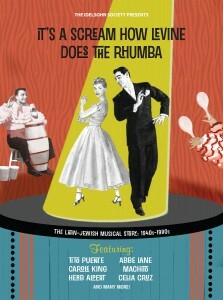 Come out to San Francisco’s Contemporary Jewish Museum on December 5th to celebrate our new CD release It’s a Scream How Levine Does the Rhumba. We’ll be teaming up with DJ Oro11 and DeeJay Theory of the SF Latin club party, Tormenta Tropical. Food by Wise Sons Deli. 6:30-8:30pm. And pick up a copy (or two) of the new album!